I’ve been thinking more about some of the challenges related to adoption of agile SDLC methods in larger enterprises. A key concept that keeps coming up is the importance of project management and how it relates to the agile SDLC (using Scrum as example here). Some people seem to believe that agile SDLC miraculously occurs without good quality inputs. But it is just like anything else in computing – Garbage-in, Garbage-out. 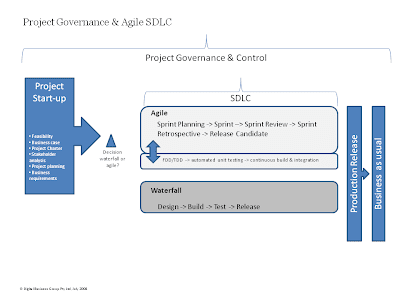 Thus it is important to ensure that the agile SDLC is being executed within a sound overall project management and governance framework. And an important input into the Scrum SDLC process is a reasonable set of business requirements (not a formal Software Requirements Specification per IEEE 830, but rather a plain English outline of the business needs in non-technical terms). This is a critical input for the development of a feature list and user stories for Scrum. There appears to be a belief in some quarters that an agile SDLC approach is un-disciplined and a bit ‘cowboy-ish’, but that belief is not correct. Executed properly agile methods are often more disciplined than a traditional waterfall approach. The most important control provided in Scrum is the feature and/or test driven development in short sprints of 10-20 days, together with automated unit testing and continuous build and integration. The relatively simple sprint-based approach outlined in the Scrum process coupled with the rigour of continuous integration and automated unit testing can reduce development risk substantially. The risk is reduced by developing based on finer grained requirements in the way of user stories and high levels of business owner involvement in clarification and prioritisation. (2) Lack of automated testing and continuous integration (skills, tools or both). Without these key elements in place, together with appropriate overall project management, then it might be better to stick with a waterfall SDLC. OMG! I just discovered I have not updated this since last month… You would not believe how tidy my house now is. Jealous much? Don’t be, it was very painful.. I am frantic with setting fire to people wearing Crocs, a ticking crocodile, just generally being a nuisance to anyone unfortunate to cross my path, my day seems to be a litany of stuff and giggles from 4am to whenever. I am not complaining though. life is good. I make a solemn vow won’t blog until the next time booze prices go up and I have to get sober for a while. Peace! Seriously? All change is difficult. It requires strong leadership and an understanding of foundations needed to instantiate the desired change. Most of all change requires that ingrained habits are replaced with new habits. And, since we are creatures of habit, change is very hard for human beings. For the practitioner of scrum and agile development techniques this aversion to change and the resilience of old ways is a key challenge. Within any enterprise exists an established hierarchy. Inherent in this hierarchy are rules that govern rewards, promotion, power, punishment and failure. Many people within that hierarchy have invested large amounts of effort, emotion and pride into meeting the demands of these rules. We have vast amounts of longitudinal evidence that it is hard to build what users want to meet their budgets and time lines. The well known Standish Reports on software development projects show that in 2006 “19 percent of projects begun were outright failures, compared with 31.1 percent in 1994”. These are not very good results, even if they have improved over a decade. Agile methods such as scrum are an attempt to address this perennial problem. However, in trying to implement them we are embarking upon a significant corporate change program. For the past 30 or so years we have inculcated in people adherence to a system of software development that is generally termed “waterfall“. This software development life cycle (SDLC) approach is very structured and is actioned like a Henry Ford style production line. This means that the hierarchy around software development in most company’s IT department is tied in strongly to the waterfall approach to systems development. This focus on the waterfall SDLC is also reinforced by non-IT management who like it because it appears to offer control and structure. The documents, GANTT charts, diagrams and other artifacts give management comfort that all is under control. Yet the very results we see for software projects every day around the world tell us that this control and structure is merely an illusion. The question I have been asking for several years now is have we found a better way? And, is that way agile or is it merely another illusion? What shall I talk about at MOBILIZETHIS08? The purpose of MobilizeThis2008 is to bring educators, e-learning technologists, managers, tech-heads and cross-sector organisation representatives together in a program that fosters conversations, workshops and online experiences to inform practical pedagogical practice employing ICT’s in an open and global context. Networked Literacies : Finding Our Ways Out Of The Walled Gardens. Any suggestions for themes are most welcome. In recent times there has been talk in the press about the dangers and evils of social networking technology (Facebook, Myspace, etc. ) in the workplace. Many commentators voice concerns about employees wasting time at work. (c) it says something important about the individual concerned and their relationship with that particular workplace. There is nothing inherent in the nature of social networking technology that is bad, even in the workplace. These debates are a reminder of the conversations of a previous generation debating placing telephones on every desk. There was sincere debate that office juniors would spend all their time chatting to friends and that productivity would be doomed by placing a phone on the desk in front of them. Strangely enough there is a phone on every desk in offices nowadays and we tend to use them responsibly. Where individuals are irresponsible in using the telephone the managers counsel or fire the recalcitrant. The majority of us make the odd personal phone call. Social networking is analogous to the telephone. One day we’ll laugh at how silly the debate really was. The key issue for business to note is that engaged and enthused staff tend not to waste time. When staff are visibly wasting time on the job it is time to stop and ask why that behaviour is happening – is it a one-off or is it systemic, is us or is it them? In recent times I’ve been involved in both delivery and receipt of education and training at tertiary and vocational levels. On the delivery side, lecturing to postgraduate accounting students at Macquarie University and delivering workplace training. On the learning side I’m an external student in law at QUT and have just completed a Certificate IV in Workplace Training and Assessment. The contrast in learning approaches between the Tertiary and Vocational Education & Training (VET) sectors is quite stark. In the university setting the process of teaching is still often with the teacher as ‘authority’ standing out in front of the class providing the ‘facts’ to be absorbed by the students. The students sit passively in their seats and dutifully take down notes. Some engagement with the students is encouraged by setting questions for them prepare before class and then discussing them in class. But still the model is quite passive from a student perspective. In this model there seems to be little understanding of different learning styles, and ideas like action learning are not widely adopted. Some university courses are more interactive – for example, some of the subjects I took at MGSM where we learned theory and then played games to embed the theory. To this day I still recall the learnings from those kinds of courses. In the vocational setting there is a strong emphasis on different learning styles, action learning techniques, and high levels of learner engagement and involvement are sought. The trainer is more of a facilitator of learning and co-creator of understanding when VET training is at its best. Upon reflection I think this is because the VET sector is required to assess competencies, often on a much shorter time frame than in other settings. Also the industry focus for VET seems to drive a focus on people who can actually ‘do’ things to a pre-defined level of competency immediately after their training. Whereas in the tertiary sector perhaps the connection between theoretical knowledge and the ‘doing’ of things is more remote. Admittedly in tertiary subjects there is often a large amount of theory to be mastered, often higher than in a VET course. But I still question how much theory people can absorb and understand if it is delivered to them as a passive audience. We’ve all studied subjects for an entire semester only to forget that content almost immediately after the exams. As an adult learner the Confucian saying really holds true: “I Hear and I Forget, I See and I Learn, I Do and I Understand“. The real question is how can this kind of insight inform our tertiary education activities? This image shows yet another offensive way of interacting with people who do not want to add your application in Facebook. Here the application still wants you to log in merely so it can then never annoy you again. It is just plain annoying – this kind of application rudeness is really turning Facebook into a utility where I keep contact details rather than a social networking medium where I spend a lot of time (which might be bad for advertisers???). I’m certainly putting a lot more time into other social networking applications that don’t allow or enable this kind of offensive behaviour. Now don’t even let me get started on the evil Facebook applications that force (blackmail?) users into inviting all of their friends merely to unlock the next feature!